Chief Minister Biplab Kumar Deb has said that his government will take forward the legacy of Tripura’s last king Maharaja Bir Bikram Kishore Manikya who ruled the princely state from 1923-1947. “He was the father of modern Tripura and dreamed to make it the best state in India. The present BJP government is also working on the same lines,” Deb said here on Wednesday night. Inaugurating the five-day long Maharaja Bir Bikram Kishore Jayanti, Deb said that in 1942 Manikya got the Agartala airport constructed. It played a crucial role in the World War II. The Agartala airport was renamed Maharaja Bir Bikram Airport in July. Beside setting up many schools, colleges, the king had also brought the Burmese company into Tripura to explore natural gas, found abundantly in the bordering state. The merger agreement was signed with Kanchan Prabha Devi, the then regent. The king died in May 1947 at the age of 39 years only. The Chief Minister said that Prime Minister Narendra Modi had announced to make Tripura a ‘HIRA’ by developing highways, i-ways (internet), roadways and airways. “After the completion of the under construction bridge over river Feni in southern Tripura, the state will be directly connected with the Chittagong international sea port in neighbouring Bangladesh,” he added. 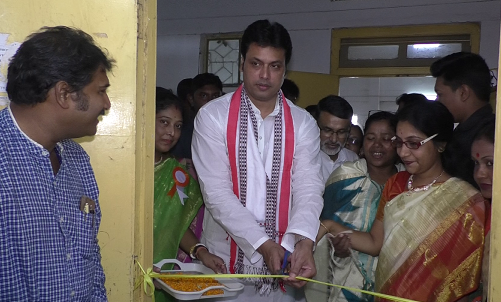 It would transform Tripura into a ‘business hub’ for all the northeastern states. Deb said the state government would create a tourism circuit to connect tourism spots in the other states.